Heather Dessinger 395 Comments This post contains affiliate links. Slow-mo sliding into that kid like you’re stealing third. That’ll teach him to offer your sweet child a dose of congealed red #40, high-fructose corn syrup and modified corn starch ever again I’m sure! Now stand up missy, dust yourself off, and walk away. If you happen to have these super easy candies on hand, simply jump back in time and hand them some to share. Because you’re not the mom who says “no,” and you’re not the mom who brings boring old carrot sticks. Nope. You’re the mom who brings yummy gummy goodness that kids are sure to love. They fact that they’re free of refined sugar and artificial dyes can be our little secret. Now fluff that cape and strut, mama, because you just averted a playground meltdown! And While You’re At It . . . Pop a few in your mouth too, because not only are these babies loaded with glycine and proline, which are helpful for healing digestive issues. They’re also rich in an essential nutrient for gorgeous skin, lustrous hair, and strong nails – collagen! Big high five to Chelsey Mark, whose comment on my a thread in my Facebook page inspired this recipe. Thanks Chelsey! Additional flavoring - I like to use 1/2 teaspoon citrus zest 1/2 teaspoon lemon extract OR 5 drops food grade lemon/orange essential oil. Makes the flavor much better/stronger. Heat over low heat until it's nice and melty, stirring constantly. Add food coloring and/or extract if desired - you're almost done now! Grab an ice cube tray or silicone mold. You can use a basic pan, too, and then just cut into squares or use a cookie cutter after it's set. Pour in the mixture, then pop in the freezer for 5-10 minutes to firm up. Once they're out of the freezer they will stay firm at room temperature. Looking for more kid-friendly snacks? Incredible!! My daughter is obsessed with stars and we already have the mold! Thanks a million! Is there any water in this recipe or just 1/3 cup lemon juice the only liquid? How many gummies does one batch produce? 1/3 cup of juice is a very small amount – does it even fill one candy tray? How many it makes will depend on the size of your mold. I don’t remember exactly how many gummies the recipe makes with my molds but it is more than one tray. I normally double the recipe or triple it, otherwise they’re all gone too quick! I bet you’ll come up with an awesome variation I’d never think to use – probably a kombucha version or something! When you do, I hope you’ll stop by and share it! I’m going to try this recipe using my left-over yogurt whey instead of water. I have a feeling it’s going to turn out great! Thanks for the recipe, Mommypotamus! 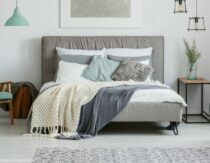 Could I crush alfalfa supplements in this for when my son’s allergies are acting up, or will it not be effective? Try decocting (or making a tincture) with alfalfa. The tincture extracts the properties of the alfalfa and leaves only a liquid behind. Just a suggestion – I haven’t done this yet. Is that what you did for these shapes? Use a pan and cookie cutter? What about the star one with the lines? So cute! I’ve been checking out different options for molds. I see plastic candy molds and the silicone molds. Do you think the silicone is better than the plastic? I know that neither one is preferred, but is there one that is better than the other? I was wondering about the silicone molds as well. In fact, I was up WAY too late researching whether it’s safe or not. Nothing definitive out there. I don’t think I would ever bake with them, like you. The molds are SO DARN CUTE though so I’m glad I came across your idea about freezing them first! It seems reasonable to me! THANKS! It could be, Cristy ‘Fonseca’ Kuyath, but I don’t know if you could add much without changing the texture. It’s worth a try, though! Thank you thank you thank you thank you thank you. My kids really enjoyed gummy candies when we weren’t on gaps and it’s so nice to have something they can have but not feel like they’re missing out! I was wondering the same thing. Seems most juices would work? Did you try others? Yay! With school starting up, my kids get sad that they don’t have fruit snacks in their lunch like all of the other kids. Thanks! thanks! love this. my daughter will love it. just wondering if i can add the honey last, without heating it. i read that heating honey reduces the heath benefits. Heather, are these safe to eat during pregnancy? Just making sure! Thanks! Oh yay! I can’t wait to try these! After so many weeks of little kids handing my child their fruit snacks, I can finally have something better on hand. Thank you!!!! Awww, this makes me smile! Hope your littles like them as much as mine do. I almost didn’t get a photo for this post because they kept swiping them! You can use lemon juice like the regular recipe, but add a 1/2 tsp of orange extract. Tastes just like a sour orange-flavored candy! Yum! Thanks for the tip, Bethany! When you say orange oil, do you mean essential oil? And do you have a brand you recommend? Looks great! Do they need to be kept in the fridge or freezer after making them to stay firm? Sounds great! Really want to try this! What is your source for grassfed gelatin? I used Bernard Jensen bovine gelatin. My gummies turned out opaque (they looked like honey soap) and had a harder chewiness than regular gummies. What can I do to make them translucent and softer? Mine came out the same way, I am pretty sure it is because we heated them for too long. Good point about the texture. My little “prince and the pea” can normally tell when I crush them and try to hide them…any ideas on how to get a three year old to take his supplements? I’m all out of ideas! Crush them into a fine powder (really fine, no chunks at all) and blend this into a smoothie. im wondering if you could substitute maple syrup or somethlng for the honey…? My daughter has fructose so NO honey. Yes, you could use maple syrup. could you use a different juice for flavoring? Certain raw juices have enzymes that will break down the protein in gelatin, turning it back into liquid. That is why you can put canned pineapple into the traditional Jell-O mold, but not fresh pineapple. The enzymes may be good for us, but not always good for the gummies! Wow, thanks for posting those links. I had been making our fruit snacks with juice for a while now, organic only, but now I see that not even that is safe. Will not use it again!!! Yikes, what a scary article. Can I ask, why don’t you use silicone? I am just curious as I have switched to nearly all stainless steel and glass, but some items like my coffee mug is all glass with silicone in the lid to help it stay on. Thanks for keeping us all up to date on this! Hi Jessica, after further research I am more comfortable with using silicone, but only the high quality stuff. Lower quality silicone may be mixed with plasticizers and such that may leach, but from what I understand the good stuff is non-reactive (like glass). This article implies that gelatin is a good source of protein. This is false. “Although gelatin is 98–99% protein by dry weight, the body cannot readily use it. 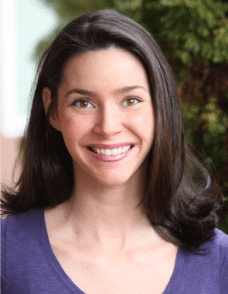 “You know how, over the past century or so, we’ve skewed our fatty acid intake by eating less animal fat and more vegetable oils, so that we’re getting way too many omega-6 fatty acids and not enough omega-3s, too many unsaturates and not enough saturates? In exactly the same way, we have been skewing our balance of amino acids, the building blocks of protein. Gelatin-rich foods, from bone broths to head cheese to foods like pig’s feet and ox tails, were a large part of a traditional diet Our ancestors relished every part of the animal, and just as they ate organ meats that most modern Americans now spurn, they also ate all the gelatin-rich bony and cartilaginous bits of the animal. In this modern era of muscle meat and little but muscle meat — think boneless skinless chicken breast — much of this gelatin has vanished from the diet, but our bodies’ need for it has not. Although Clive McKay’s studies of life extension through caloric restriction were done in the 1930s, only a few studies have been done to find out which nutrients’ restriction contributes most to extending the life span. Restricting toxic heavy metals, without restricting calories, produces about the same life-extending effect as caloric restriction. Restricting only tryptophan, or only cysteine, produces a greater extension of the life span than achieved in most of the studies of caloric restriction. How great would be the life-span extension if both tryptophan and cysteine were restricted at the same time? Both tryptophan and cysteine inhibit thyroid function and mitochondrial energy production, and have other effects that decrease the ability to withstand stress. Tryptophan is the precursor to serotonin, which causes inflammation, immunodepression, and generally the same changes seen in aging. Histidine is another amino acid precursor to a mediator of inflammation, histamine; would the restriction of histidine in the diet have a longevity promoting effect, too? Did you get all that? Looks like this says that one of the charges against a meat-heavy diet — that it can shorten lifespan and increase inflammation — can be true if one constructs the protein part of one’s diet largely of muscle meats and other collagen-poor proteins. Great answer! I just love it. 🙂 …and of course..I had to comment because I think the recipe is brilliant! I need to stop eating chocolate candies, get more gelatin in my diet, and have some safe candy for the kids. Triple score! YES! 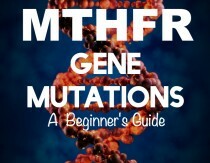 My little one is diagnosed with methylmalonic acidemia and cannot process methionine, threonine, isoleucine, and valine. Those four Amino Acids must be limited. So maybe I can feed her foods containing gelatin without ill-effect. Thank you. Aaron, could you please post your source for this quote so I can look into it some more? Hi Robin, how was your little one diagnosed? My 6y.o. son is a light-weight one and I will be seeing a pediatrician soon. I suspect some sort of malabsorption but need to prepare good questions. Thanks! Is the lime/lemon juice just that. . .juice from the fruit? Or do you mean lime/lemon juice as in prepared lemonade or limeade? I’m sure she meant fresh squeezed juice – right from the fruit itself. The juice is fresh squeezed! If your mold is deep, fill it about halfway because the gummies will rise. Delish! What brand of gelatin do you use? Perfect!!! I need to make these, like, NOW!!! Would stevia extract work or does the honey help the texture? I think it would probably work, but you might need to increase your juice content by a couple of tablespoons to keep it from becoming too rubbery. How much Stevia would you recommend. We are on a low sugar diet and I think all the other ingredients would work, but the honey. Thanks for your response. LOVE THIS! I’m going to make kombucha and elderberry versions this week. did you ever make these flavours? I’m interested…. share your version if you did?! please? Ok, one more question. . .have you tried these with fruit puree instead of just juice from fruit? I pureed berries and it worked awesome!!! I still used a little lime and lemon juice because I like the tangy taste. I love these!!!! Heather, did you mention where you ordered the food coloring from? I’ve got to get my hands on that stuff! Amy Rhodes McClellan – I haven’t, but if you do please let me know how they turn out! Oh my gosh, I am trying these today. Or, perhaps tomorrow. I need to hunt down a lemon. My kids will love these. Thank you! I love the shapes!! We’ve been making something similar with a few drops of beet juice for color, but they’ve been in ice cube style trays- I didn’t even think of molds, lol! I was trying to figure out the cookie cutter issue and now I don’t have to! 🙂 My GAPS clients will love this! I can’t wait to try these!!! 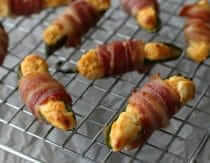 I’m going to make them this afternoon! Thank you so much!!! Where do we get the grassfed gelatin? Hi Heather, is the honey a must, or is there an alternative like stevia? Just made these and my boys love them! We make ‘jigglers’ lots but these are even better. I’m going to try cherry next…oh, and I put a picture of them on my page and shared your post! I made these with maple syrup (we were out of honey) and everyone but my super-picky brother with food aversions loved them. Next I will experiment with adding flavor extracts, such as orange or lemon. If someone makes a kombucha version, certainly I would try it, but then my sister wouldn’t touch them. Angelo Castiglione – I haven’t tried it with stevia but I think it would work fine. You might want to add a couple extra tablespoons of water/juice to the mixture so final product isn’t too rubbery, though! SO GLAD you liked them, Susan Quirk! I guess I’m clueless, but I didn’t see how to make the summy starts when I opened your link. DonnaL. Thanks! I’m so excited to try this! I attempted gummies several years ago, but I just ended up w/ a giant blob on my counter that never firmed up. You use a LOT of gelatin – maybe I just needed more. Sorry, Keith Raymond Shelton! Maybe try reopening and see if you can scroll all the way to the bottom? It should be there . . .
How much stevia did you use and what form (liquid or powder)? Thank you for your response. I made them! They are amazing!!!!! I made one batch with camu camu berry powder to add a punch of vitamin C as well! Thank you so much for this wonderful recipe! My children love them! Why don’t you use silicone? You should do a post on this! I can not wait to try these!! Ahhh, so glad you liked them Rachel Bayes! just made these – thank you! I was missing sour candy. 🙂 I’ve only dabbled in candy making. Is there a trick to no getting bubbles on top? The mold side looks perfect. Bubbles or not — they are easy and delicious. Big thanks! Quick question, how many molds does one batch fill? I am trying to decide if I need the whole set of three or if one would suffice. Thank you! Tyank you for this recipe. You mentioned the enzymes in fresh juice/ fruit possibly inhibiting the gel setting but the lemon juice is ok. Apparently someone tried it with orange juice and it didn’t inhibit the gel – yay! I think blueberries would probably work well! I <3 you Heather! Fruit snacks have been one of Bekah's guilty pleasures. I can't wait to try these! Love the idea that one of the commenters had about trying it with elderberry too! Thank you for this recipe! Big hit with my almost 3-year old. You hit the nail on the head about being the mommy trying to bring carrot sticks to the playground/play dates! 🙂 This will be a much bigger hit. I didn’t have any coloring to add, but the lemon juice made a nice golden yellow colored candy. Or . . you could puree or juice the carrot sticks, add gelatin and Voila! – Carrot Stars. Experiment with seasonings, honey, celery juice or other additions, and see what you like best. If you can juice it – you can make it into Jelly Stars. If you have a dog, he will love chicken broth stars – made the same way, but with broth instead of juice and honey. Made these today with orange juice I had squeezed and stuck in the freezer a couple of months back. I found a princess castle mold and robots mold at TJMaxx and my kids are really excited! They get to try one today and then have them when they need something for a treat when other people have stuff they can’t eat! Thank you SO much for posting this! Ahhh, that’s fantastic! I didn’t realize it would work with OJ but that’s great to know! This seriously looks awesome!!!! Now I can eat gummy again, not having to worry about crap they put in it and all 🙂 Thanks! You’re so welcome! I hope you like them as much as we do! Wow, these turned out so wonderful. I substituted cherry juice for lemon and it was so yummy. This is giving me ideas for so many more kinds. Thanks so much! The picture is beautiful as well. I tried these today using blueberry kombucha. I added half the kombucha and warmed it with the honey and gelatin, and added the other half when it was cooler so as to keep some probiotic element to it. I added some drops of lemon too. They have been in the freezer for over an hour and still haven’t set properly. They are just gloopy and taste like straight honey. Total fail 🙁 Will have to try juice 🙂 But I’m not sure about the honey. It seems so strong in the outcome. I think I’ll only use a teaspoon of honey and then some stevia. A-ha! Now I can try to replicate the CLO gummy fish that Blue Ice is no longer making. It’s the only way i can get CLO into my offspring. Ahhh, that is an amazing idea Jennifer! It might take some work to figure out how to keep from cooking the FCLO but I’m sure it’s doable! We always add 2 syringe fulls of fclo per recipe. We add one extra tbls of gelatin too. I let it cool some before adding, but not before it starts to really set up. If you use the flavored fclos then you will be sure to cover the slight fishiness that can come through. Using some lemon concentrate in place of just the juice helps too. My 3 year old has no idea that her much hated flco is hidden this way. You saved me. I have been craving gummies but couldn’t have them due to massive guilt, (also Paleo) and now I can! WOO! It’s a great day when I get a WOO! in the comments. Thank you, Chris, and I hope you like them as much as we do! These are awesome, thanks for the idea. why dont you cook with silicone. We dont use it, but I was looking for info on why we shouldnt. Made these today – followed recipe exactly and they came out great! We did three batches – one batch doesn’t seem to make much. The kids had a fun time doing it too. Looking forward to variations. Would LOVE to find a way to get the FCLO into these!!!! These are SO MUCH FUN!!! Made a batch today. They were super easy! I babysat a little girl for months and she brought her own breakfast/lunch/snacks. Every day she brought, among many other very unhealthy, but visually appealing things, gummies. Bright, colorful little jewels that my 3 dear children stared longingly at, knowing their mother would never-in-a-miliion-years let them have the little packages of chewy sweetness. They would excitedly ask her each day, “what kind of gummies do you have today?! Phineas and Ferb?! Jake and the Neverland Pirates?!”. And, then, they would turn their attention to the home-made dehydrated fruit their momma had made for them. They know we eat different…and they are mostly ok with that. But, today. Today, I presented them with glorious fun shapes of lemon-lime sour gummy candy. “GUMMIES!! !”, they squealed. It was awesome. And, they taste awesome, too. THANK YOU! Thank you! Thank you. For Real! Oh my goodness, this is one of my favorite comments OF. ALL. TIME. Yay for gummies! I made these today and they were pretty good. I made sour ones and sweeter ones using berry kvass instead of lemon juice. My 3 year old didn’t care for them, but I think I’ll try again with some strawberry extract (strawberry is her favorite). She sure did like playing with them though lol. Mine didn’t turn out pretty and translucent like your picture; they are definitely opaque. I used the Great Lakes brand gelatin and raw honey. Maybe I need to heat longer? Any ideas? I’m not sure, Kristen! I think it probably has to do with the fact that I started with a light color (from the lemon juice) and just added a few drops of natural coloring. Mine are in the freezer now and my mixture was opaque with just the juice and (Great Lakes) gelatin before I added honey and coloring. I couldn’t figure out why either, but definitely not clear! Same problem here – Great Lakes, raw honey, India Tree, lemon juice…totally opaque and not pretty at all. Also, really tough – too springy/chewy. My boys hated them 🙁 They’re really particular, so I’m not totally surprised, but I think if they looked like yours and had a gummy rather than rubbery texture I’d have had more luck. Any advice? Desperate! These are GREAT for the Feingold Program (www.feingold.org) which is a non-profit organization that teaches us to avoid petrochemical additives. Thanks for posting this! Just made these with my 4 year old… tasty and fun! we cut them up, but I will definitely use molds next time. Thanks for this great idea! Been making these all week, trying different variations and enjoying every fun bite. Thank you! So glad to hear that, Michelle! I’d love to know about any combos you come up with that you really love! I’m not a kid, but I love these. I’ve been looking for a way to get more gelatin in my diet (i’m glycine deficient) and these are perfect. Thank you! Thank you thank you thank you! I have tried several homemade gummy recipes, but they always come out like really hard jello, which does not fool my 5 year old. Today we made these together, beginning to end, he got to do all the stirring and “dumping,” and the only thing better than the making was the eating (it helps that he’s a huge fan of lemon and other tart foods). I am in for every variation on this page and more! I think I’ll work on cranberry ones for him as well. I finally got around to making these today and my goodness! My almost 3 year old would like you to know she LOVES them. My husband made a funny pucker face that was pretty cute as well. Thank you so much ! Yay! There’s nothing I like more than winning over a three year old! I used an ounce (4 packets) of store-bought gelatin on the theory that a tablespoon was half an ounce. It was way too much. My 2 1/2 year-old enjoyed making them with me and running around with them, but they had the consistency of a pig knuckle. Would one packet be enough? Hi Ion, I believe you’d need only 3 packets, but the best thing to do would be to pour the packets into a tablespoon and measure as you go. I made these, and they were a hit. Next time, however, I will definitely add the extra pucker power (which I omitted this time). But, I left them out, and they have turned too hard and dry to eat. Any ideas for resurrecting them? Oh, and I find that two packets of the Knox per 1/3 cup of juice is about right. 3 tablespoons of Knox is too much. Haven’t tried one packet yet cause I’m off to find some grass-fed stuff. Marshmallows, jello, jelly candies, what else can you do with gelatin? Can you double or triple the recipe to make more? When following the recipe, it looks like I got 4 1inch squares out of it. And I must try Kombucha! Yes can double/triple it. I am right now! So I tried making these with lemon first, but Great lakes gelatin is a bit stinky when wet, and I think I burned it a bit, then stuck in the freezer. They ended up tasting like freezer and sour-sweet gelatin stink. I have since tried it with strained blackberries and then raspberry juice. Both were delicious! I haven’t quite gotten that gummy bear consistency, though. Just a couple of things I learned: If possible, let the gelatin “bloom,” no reason to let it boil, and for setting, let it first rest on the counter, then cover with something (to avoid freezer/fridge smell), then chill. The raspberry was especially good! Thanks for this recipe! I love them. I think they will be perfect for getting more calories into me when I am too sick to eat regular food due to chemotherapy treatments. I am diabetic and can have some honey, but will try half honey with some stevia to keep the glycemic factor a little lower. I am also going to try some additional juice to see if they become “jigglers”. I got the Great Lakes gelatin at “Natural Grocers” for about $15. I continue to be more and more amazed at what the food industry is trying to pass off as food. . . . thanks for helping us eat without giving in to their cr*p. Tell people that eating right, though expensive compared to eating SAD junk, is WAY cheaper then chemotherapy! 🙂 I wish I knew better 30 years ago. So I tried these today and they were firm and just the right amount of sour, but they were very sticky! So I read on another website to sprinkle a bit of cornstarch on them so they dont stick. It worked, but it gave it a different taste. It’s not horribly bad, but I wish I didnt have to use the cornstarch. Any suggestions for the stickiness? Thanks for the sharing btw! so I think this is my 3rd post for this… they are just so fun.. we keep making them and trying new flavor combos. we’ve done apple cinnamon, sour grape, sour blueberry, blueberry, sour cherry and of course lemon and lime. the blueberry and cherry ones have really pretty colors without any added dyes and they taste so yummy. sour blueberry is a house favorite. What is in your sour blueberry recipe? I tried these per the recipe, using 3 packets of Knox gelatin (each packet measured out to be a tablespoon). I agree with the person above who said 3 packets is too much. I”ll try again with two and see if that helps. Also, they were incredibly sticky, and near impossible to get out of the ice cube tray whole. I’ll see if those two things are helped by using less gelatin. They were tasty. Hmm, I really can’t figure out why they would be sticky. We make them all the time and they always turn out the same – maybe the brand of gelatin makes a difference? I can’t imagine it would be that but this is just such a mystery to me! Another big fan of these! I’m not a mom yet, they were for me. 🙂 Yummy in mah tummy! I am using this as a gateway drug to bone broth. Thanks for such an easy, wonderful recipe! Lol, Laura! So glad you liked them! What s proceddure for the orange color? I would definitely use parchment paper! And oops! I didn’t realize I didn’t specify about the extracts – they’d go in after the mixture is heated when you’re just about to pour. Mine’s more like like flubber. Definitely not clear, but foamy and too much for little mouths to chew. Tastes ok.n Anybody have any thoughts? Thanks so much for the recipe. To be honest, I didn’t think this recipe would work for me but it did. I thought for sure my local Whole Foods Market would have the bovine gelatin but they did not. I was too impatient to order from Amazon but was able to find some of the Bernard Jensen brand at the Vitamin Shoppe. I am going to experiment with other flavors. Oh, I’ve made these twice and both times ended up with a bit of foam at the top. Am I overheating the mixture? Replying to my post to add that I tried making ginger lemon ones by simmering some sliced peeled ginger in water and using a mixture of half ginger water + half lemon juice plus the gelatin and honey. So far this is my kids’ favorite flavor. Also tried cinnamon by simmering cinnamon sticks in water. I am going to try coffee next! Thank you for this recipe, we all love it. However, I’ve made four batches now and they are all cloudy. Anyone else noticed this? I just noticed my Great Lakes gelatine is porcine and not beef – could that be why? mine is cloudy too, and wondering if my technique is off. i use beef gelatin. Just made these and they are delish! Thanks! You are amazing! Thanks so much! I just got my order of gelatin and it looks as though I ordered Great Lakes Porcine Gelatin! Whoops! Think it’s just as good quality and won’t change the flavor? Yes, I think so. I prefer the beef gelatin because it comes from grass-fed cows, while the porcine gelatin comes from pigs that are fed leftovers from grocery stores and restaurants. This sounds soo cool, I wonder though how much gelatin is in weight because here in UK we have thin sheets and those are not easy transformed into spoons, thanks! wonder if it’s ok to post this on my blog but in Russian? What do you think about making these with kombucha? Will heating kill off all of the good probiotics? I am going to add fermented cod liver oil to this recipe to see if that helps my toddler start taking it again. I just wanted you to know, I just made these with Blood orange and Cara Cara orange juice I squeezed. The color is beautiful and I only used 2 TBS Raw honey. I don’t have any children at home, but I don’t think I can keep my hands off of them 😉 Thank you so much for a alternative way to get my gelatin in!! LOVE these! They came out so great and I followed the recipe exactly and used Indian Tree food coloring. I am definitely going to make these again and try out some of the oil flavorings. Yikes! Maybe use more lemon or orange oil? I am having the same problem with the smell. Doesn’t seem to bother most people but I can’t stomach it. I tried making this with just 2 tablespoons of the gelatin and it was perfect! Still gelled as it should but the smell was gone! What brand of grass fed gelatin do you use? These turned out great tonight! 10 min in the freezer was perfect. I plan to try a recipe using frozen fruit tomorrow, hopefully, now that this one was a success. I feel great letting my kids dig into these! I’m so excited to try this! I made the mistake of starting my daughter on gummy omega 3’s and vit d and now I want to switch her to a liquid but she LOVES her gummies so it’ll be nice to be able to offer her a different gummy instead! Why do the molds have to be kept in the freezer before adding the liquid? Does it have to cool off first before you pour into the molds? Also, what do you think about making strawberry juice? If i put them in the vitamix with a little water? Do you think it’ll work for the gummies? These are AMAAAAZING! I made the lemon ones last night and accidentally ate them all. Oops! so I made lime this morning for the kiddo and added the honey and CLO in after it cooled off a bit. I also added two frozen blueberries while warming that I fished out after. They gave the gummies a beautiful pinky/peach color. I have already had a silicon star tray and I fill them to the top then cut them down the middle so I get double the stars. I also have a pumpkin tray that I fill just slightly for some circular gummies. Thanks so much for this recipe I do hope I can get him addicted to these…if not they won’t be a waste as I am addicted :). OMG Yum!!! Seriously yumm-O!! These were amazing. I could easily have eaten them all in one sitting!! I’ll have to triple the recipe next time. 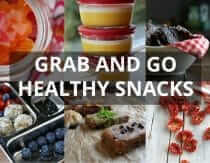 How awesome to have a healthy snack that’s also delicious!! Well done Heather I’m impressed! Can’t wait to make these. Thanks! I have had this recipe bookmarked and pinned for a while now and have yet to make it, but every time I read your opening word picture I laugh because that is TOTALLY me (at least in my head) when I even think about someone giving Evelyn those horrible “snacks”! Now that you are corn free, are you still able to use the natural food coloring in the gummy treats? I am pretty sure it has corn in it. I’d love to hear what you are doing instead! We are gluten, dairy, egg, and corn free!! You’d have to contact India Tree to make sure, but the ingredients they list are only glycerin, citric acid and vegetable-based food colorants. Citric acid can be derived from corn so it’s theoretically possible, but I know they don’t use corn syrup or anything. It’s hard to find healthier snacks for my son that he actually likes. I’m sure he’ll love these! Wow – those were crazy easy and all my kids (even teens) love them! I just used beet juice (asked my man to juice me a beet before he started his daily juicing) – maybe 1 tsp, probably less, like a splash, gave it very nice rich color without having to buy any products! I love gummy candy! Thank you for showing me how to make a healthier version. Wow I never knew they would still stay firm at room temperature. I will have to try this. How many can we take a day? Thanks! First batch of cherry & lemon juice was good. 2nd batch was watermelon and water – not bad. 3rd batch was cherry, watermelon & water — not a good combo. My daughter & I spit out as it was really tart. I think I used just a bit too much cherry! I made these last night, put them in the freezer until solid, placed them into the fridge as directed, and they turned back to liquid. I used Great Lakes gelatin and freshly squeezed lemon juice. Sarah, do you happen to have the Great Lakes collagen hydrolysate? It dissolves at room temp. I’ve made three batches and all 3 failed to firm. Not sure what I am doing wrong, but I am using the collagen hydrolysate. Any thoughts? Heidi, collagen hydrolysate is meant to dissolve in cold liquids without gelling. To get gummies that firm, try using regular grass-fed gelatin. Wow! I just made these, and we LOVE them. I was afraid the honey flavor would be too strong, but it’s actually very subtle. I can’t wait to make other flavors. Thank you for sharing a healthy treat recipe. I want to be refined-sugar-free, but not fun-free! Can NOT wait to try this. I just ordered the gelatin to be able to make these. We are GAPS/anti-yeast, so will have to try with the green stevia powder and a bit of extra liquid. I don’t think the small amount of juice, especially something like lemon juice will be a problem for anti-candida, especially once paired with the benefits of the gelatin (I have never gotten my broths to fully gel, I know the gel is still in there, but just would be pretty diluted). I also got some additional ideas such as using green tea for the liquid (our GAPS practitioner has us drinking a lot of green tea to help with detox) so even doing green tea/stevia and no lemon juice may be an option. Or green tea WITH lemon. Could potentially be steeped in lemon and ginger as well. So many ideas now! Oh my gosh, I can use these for the DH! What a great way to get him healthy snacks! Yay, I just made 2 batches of these for the first time. I don’t have grass fed gelatin yet, so I just used my store bought unflavored gelatin- about 3 packs, with lemon & lime juice. They are so yummy! I used a silicone heart mold tray that I got from Ikea- so cute! Then I made a batch with Welch’s grape juice, which I thought would be sweet enough without honey, but they came out slightly bland. Still fun though, thank you! Really great idea. I’m not in love *yet* because they came out tasting too much like beef gelatin. I thought the lemon and honey would hide the flavor. Any ideas out there for a better outcome? I doubled the recipe and used juice from one whole lemon and one whole lime, then an ounce to make up the last ounce. Used yummy and strong flavored wildflower honey. If I use more honey, will it set the same? Sorry for the typo…I used an ounce of pomegranate juice to make up the last ounce. If it were me I’d add some orange or lemon oil to increase the intensity of the citrus flavor – that’s how we make ours! This might be a really silly question but I am totally new to using gelatin. I tried this recipe and couldn’t get the gelatin to dissolve right (there were big chunks). Can you please walk me through the right way to do it? Do you mix the gelatin in with cool liquid first and then heat it? Or mix it in with warm liquid? Or what type of gelatin should I be using with this recipe (i.e., the red or green kind from Great Lakes?). Thank you so much for your help! Love your site!!! Hi, can I use normal gelatin from the store? Please answer. I’m not sure, Maryann! Is it possible they got too hot and were perhaps a bit scorched? What kind of gelatin did you use? Just tried these tonight. First time using the Great Lakes Gelatin. Definitely smells bad as warming on stove and even after chilling in freezer. I tried them anyway – tastes good (will use more extract next time) but had to hold my breath. Am I just not used to the smell of the beef gelatin? t never boiled on stove – just warmed it. Heather, this is beyond fantastic! I will try those today! BTW I completely love your blog! Thank you for it. Heather Thank you for your prompt reply! I can’t wait! I have made lemon/raspberry (not enough flavor but my fault) and then we tried rootbeer extract. Holy cow those were awesome! Like chewy root beer barrels. No I need to hit up my honey guy for another few bottles. BTW I buy my beef gelatin from Azure Standard. No funky smells at all and it works amazingly well. Please tell me how you know Great Lakes gelatin is grass-fed? I’m 62 years old and I’m concerned about my dry sun damaged facial skin. I don’t trust the chemicals in sunscreens and I’m really not into making gummy stars. No offense. I also have a mild Rosacea. And I’m not asking you to play doctor. I respect your suggestions very much. Are there any gummy stars I could purchase over the counter? Should I try applying an oil to my face? Are there any steam treatments or special skin moistureizers? Thanks so much. I am not aware of any gummy stars made with quality ingredients, but you can buy grass-fed gelatin and dissolve it into a cup of tea if that’s easier! Just made my first batch – turned out great! Thanks so much for a wonderful recipe! I’m so excited to try making these next month! I see you recommend using lemon/lime juice. Do you think freshly squeezed orange juice could also work? For some reason, freshly squeezed orange juice supposedly doesn’t set up properly when making jello – go figure! I tried these today with the gelatin you recommend. After being out of the freezer for about 20 min they got soft and sticky. And they smell awful. What did I do wrong. Also mine are cloudy. Did I cook them too long? Is gelatin supposed to smell bad? Please help. My 3 year old was so excited about these. Thanks! Hi Casey, did you happen to use the gelatin hydrolsate by Great Lakes? That particular type of gelatin is a little different from their regular – it stays liquid at room temp. Gelatin does have a bit of an odor, but from what I understand it’s normal. However, you might try cooking them at a slightly lower setting next time and taking them off the stove as soon as all the ingredients are melted together. Same thing happened to me that happened to Casey. It might be helpful if you were to put in “gelatin hydrolsate” as “grass fed” does not equal “gelatin hydrolsate”. Can you use rice syrup instead of the honey? I haven’t tried it, but probably! Most citrus essential oils are edible. but I choose to only use organic because the oil is derived from the peel where pesticide residue is most likely to collect. I have tried these stars twice, following the directionsto the letter and they neverste up. I still have a thick runnyblob in my freezer after a whole night in there! What am I doing wrong? Hi, we’re doing GAPS – have been for two years now. But with significant digestive issues, my daughter has still not been able to move onto fruit or honey. I try to make some sweet treats with coconut and sometimes add stevia to things. I’d love to make something like the sour gummy stars (she can have the following fruits – avocado, olives, lemons, limes, coconuts), but without honey. She also can’t have any dairy at all, and looks like she never will be able to. So many recipes are out of the question, as she can’t have dairy, most fruits, honey or grain. Any ideas? just tried these. They firmed up wonderfully. My son and I werent a big fan of the honey flavour though. We’ll be trying agai with just juice, and maybe some fruit puree. This is AWESOME! I love gummies, but they are soo bad for you. Now I can just make these! Thanks MommyPotamus! So I just made these with pureed peach “juice” from our peach bounty, with 3 TB lemon juice to a tripled recipe for the liquid. I put it in the Blendtec…..hahahah….it is like marshmallows! BUT the kids love it so it’s all good 🙂 They are kind of like a creme’ gummy snack. Very good and perfect for popping in the lunch box. Just made these today with tart cherry juice. The first attempt I just used juice and gelatin; when they set, they were super rubbery and didn’t taste very good. So I melted them down, added a bit more juice, some honey and lemon extract. Now they’re all set up with perfect texture and they taste so good! Love it! Thanks, Heather! One thing I have done when my daughter has been sick is make jello using medicinal tea for the liquid. I bet that would work with these little treats, too. why not use silicone for baking? same as plastic? what is safe for baking? I was wondering if anyone has tried taking a baking pan and filling it with corn/rice starch and pressing a shape in it and then filling the shapes with the mixture. Once the candies have set, you then just take them out of the starch and you can reuse it to make more. This is the method that I’ve seen the candy companies use. Thank you so much for this recipe. Its awesome to not have to trial and error forever. I have a question though…I’m curious about a few things. When my two year old eats these she always gets the hiccups afterwards. Any thoughts? Also, over the last ten years I have been teaching myself to eat meat. I am have a lot of problems with the aftertaste and smell of most meats. I have been known to puke from the smell of bacon. That being said…when I go to mix and heat the gelatin I almost gag the whole time. Did i just get a really strong batch of gelatin? OMG!!! I thought for sure this was too good to be true, but I just made gummy skulls (with cherries, water and gelatin)….my Gaps kids now have possibly the COOLEST snack to take to every halloween party this season! Thank you thank you thank you!!!! By the way, to use cherries (which also made a GREAT color) I used 2/3 cup frozen cherries with 1/3 cup water…brought that to a boil, then pureed in my blender and used that instead of lemon. Can I use frozen fruits with this recipe and blend them? Ok, have a question….not a big silicone fan but I have used them for ice. Do you think using an essential oil in them would react being that they don’t get warm? Cool the kids love gummies! But no “colors” allowed! My kids would love these, I pinned them in my healthy snacks on pinterest. I pinned the Sour Gummy Stars, my daughter is allergic to artificial color so this is awesome!!! Thanks for posting this information. I know way too many people with similar health stories that have lead to eating simple food. I would really love to try this recipe. I have Knox unflavored gelatin. I don’t think this is the same as grassfed gelatin but can I use it as a substitute? Hi AJ! Unfortunately I don’t know of any other molds that create cute little shapes. BTW, I used to have the same concerns but after looking into it I think silicon is probably inert, like glass. Only the high quality stuff, though. CHeaper stuff may have other compounds added in that I wouldn’t want in my food. I just tried to make these using pineapple juice (out of lemon juice). They were VERY frothy. Is that normal? If not normal should it still be ok? How many should/could I eat in a day for health benefits? Okay, this may seem silly, but I’m a newbie to essential oils and such. Is it okay to add sweet orange essential oil to this or is that not “food grade.” Like Eden’s Garden Sweet Orange 100% Pure Therapeutic Grade Essential Oil, would that not be appropriate for consumption? Hi Karen, I use therapeutic grade sweet orange essential oil as long as it is organic. The pesticides sprayed on orange all go into the rind (which is what’s used to make the oil), so I steer clear of non-organic varieties for culinary uses. What’s an easy way to get them out of the ice cube tray? Any tricks? these look delicious! i wonder if there’s a way to use berries to give them a chunky and seeded texture? maybe substitute the lemon juice for a berry compote of sorts? Ooooo. I just pinned this to Pinterest and ordered some gelatin. Just need my molds to arrive. Thanks for the recipe! I used unsweetened cranberry juice to add color and a tiny bit of flavour, plus orange oil. They taste like fruity orange and are a nice pink color, and the cranberry added a “sour” element without being too citrusy. I have issues with corn and so most chewy candy is out for me but this might be just the ticket! I can’t find grassfed gelatin in Canada for anything less than $35 a can. Whole Foods has organic gelatine options, I’m wondering whether that might be a reasonable substitute. I tagged this to my pinterest!! My kids will love this! I pinned the How to make fruit stars post. I chose to pin this post for the dehydrator giveaway!! I attempted to make these, but I’m not sure where I went wrong. I admittedly didn’t follow the recipe exactly. I used a jell-o gelatin instead of the grassfed and used store bought honey rather than raw. But, for the most part, I used the exact same measurements (doubled in fact) and it just didn’t gel as I thought it would. Cooled for an hour at least too. I’m curious as to whether or not I cooked it properly, actually. What do you mean by cooking it until melty? Hi Travis, I wish I could say where things went wrong but with all the variables you mentioned I really don’t know. Sorry it didn’t work out! – I used the NOW foods orange essential oil as you recommended (more went in than planned), but I noticed that it says for aromatherapy use only. Are you confident that this is a food grade oil that is safe for children? I didn’t come up with this recipe until my son was over two years old so I can’t say that I introduced it when they were young. If it were me I’d probably introduce it slowly and see how my little one felt. It’s also possible to substitute the flavoring with something else, like water kefir. Hope that helps and glad you liked the recipe! Ive made these, and they are so yummy! And I felt like I got some energy from the orange oil. Thank you, so good! I was wondering if you’ve ever put D drops in them or any other type of vitamin? I live in SE Alaska where Vitamin D deficiency is crazy common, and would love to make these yummy gummies help supplement that for my toddler. Have you ever tried? And if so, when during the process should I put it in? Maybe its really obvious but i don’t want to make silly mistakes. Also, do you use beef gelatin or another type? Thanks so much! Those orange and lemon essential oils are edible? 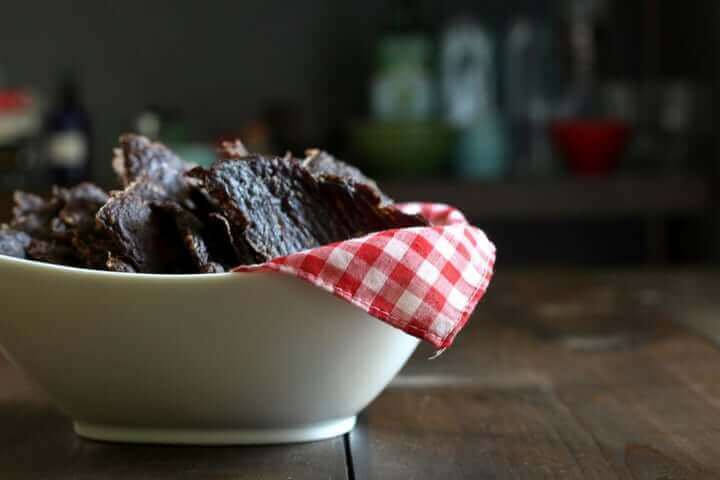 Mommypotamus, thank you so much for this recipe–and for your entire website! It is such an important resource for parents! Thank you again for your informative website! Hello, I just made these exactly as the recipe says and they are harder than regular tummies, is that normal? I could nearly get them out of the mold. Rubbery! We’ve been making variations of this recipe ever since you made this post! Thank you for it! Hi…have been wanting to make my own gummies for ages and just found your recipe today and made them this afternoon. Unfortunately, I can’t get grass fed gelatine as I live in Africa – no such fancy stuff I’m afraid! Made them with the regular gelatine, which has quite a distinctive (and not very nice) taste. Needless to say, they came out tasting awful. I’m sure nothing to do with your recipe, just the ingredients I have available (no edible oil either!). Any ideas? Hi Catherine, I think the edible oils make a huge difference. You might try using a stronger flavored liquid, such as a strong tea. I just made these. I used raw Mangrove honey that a friend brought back from FL. It gives such a nice taste to the candy. Thanks for sharing the recipe…it is definitely a keeper. I just made these with pear juice (my kids are allergic to citrus). The mixture turned out very thick and opaque, which made it hard to even spoon the mix into the molds. I’m not sure what I did wrong… help?! I’m not exactly sure, Bonne. It’s usually very easy to pour after being heated, so my guess is that the pectin in the pear juice reacted with the honey and thickened it much more than usual. I tried making these the flavour was great but the sweetes came out really cloudy and they had an almost marshmellowy texture. I use great lakes grass fed gelatin. What did i do wrong? What an awesome idea! I had to pin this as my kids over do it as far as lollies and candy is concerned and at least I would know exactly what they are eating if I made these. Thank you! I read through a lot of comments and it seems I’m the only one with this problem… I made the recipe and they taste great and have a perfect gummy consistency but they don’t come out of the silicone mold easily. How do you get them to come out nice and neat? Do they just pop out? but my lil one even loves it before it is set! 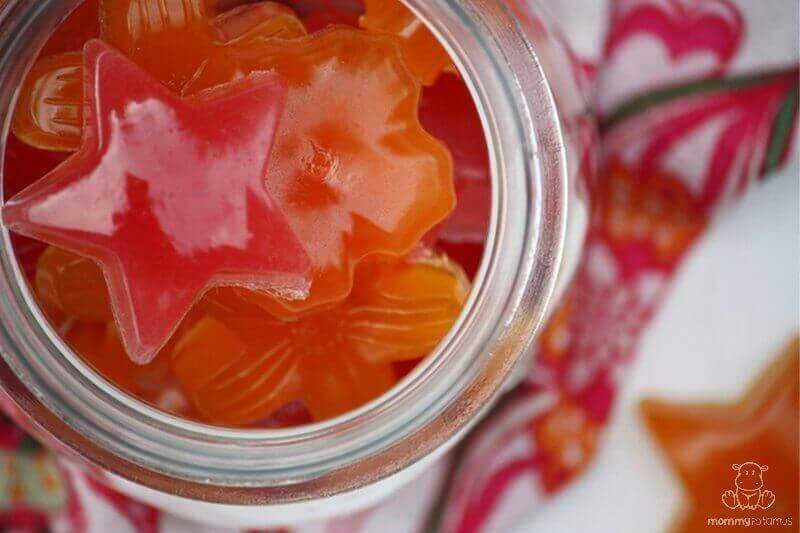 What brand and size is that cute little jar you have the gummy stars stored in? Thanks! I’ve tried making sour gummy candies out of gelatin with my kiddos, but really they just came out like firmer-than-usual jello. They weren’t a hit…are these closer to the consistency of an actual gummy bear, or just firmer jello? I’ve made these and a similar recipe and both times I get clumps of gelatin that I can’t get to blend with a whisk. Any ideas? I have the grass-fed beef gelatin that Weston A. Price recommends. Do you find the gelatin blends in easier with the mixture warm or cold? I love this recipe. Funny how you say store in fridge for up to 2 weeks because there is no way they’d last that long. Lol…and I don’t even have kids. Haha. I’m wondering if it would work with just juice…like fresh squeezed OJ instead of the extract or even the EO’s. Thanks for the superb recipe!! The recipe is super simple and non-intimidating for such a refreshing and sophisticated treat. I just made them and they came out delicious! The lemon was very strong (I used fresh squeezed lemon juice from two large lemons) so I went without adding oil. I also used a cameo candy mold I bought when I was in Prague and now I have 15 more sour gummies left to devour. Thanks for sharing. Is it possible to make these honey and sugar free? Finally got my hands on some gelatin so I could try some tummies and this was the first recipe I tested– success on the first try! So easy and yummy! Thanks for an easy, delicious base recipe! My boyfriend and I are giddy kids with this new snack option and are already brainstorming new flavors to try! I made these for the second time today. This time we used fresh squeezed orange juice and orange zest because my youngest(2) didn’t like the sour. I loved both. I doubled the recipe and still managed to eat half myself. 🙂 Thanks for the great recipe! I love how fast and easy they are to make! Dear Heather – thank you so much for the recipe – so quick and easy! We devoured the first batch with juice from key limes and I’m lining up the ingredients for round two! A fantastic way to disguise healthy gelatin! Ever since I’ve been adding gelatin to my morning tea, my hair, nails and skins are incredible! If only I could see the improvements in my joints!! Hello, Do you know how many of these to eat per day that would equal one cup of bone broth? Thank you!! Hi Kelly, the amount of gelatin in broth can vary a lot, so there isn’t really a way to measure that unfortunately. Plus, broth has minerals not contained in these gummies. I personally don’t think of this as a replacement for, but rather a complement to, bone broth. These were sooooo good! Between my nine year old, my husband and myself, we could not get enough! This recipe is a keeper!!!!!!!!!!! I cannot believe how delicious these are! And the texture is right on just like a fruit snack. My daughter is going to LOVE these tomorrow if I don’t eat them all. Thank you SO much because I tried a recipe for something similar before and they turned out all wrong. I’m thrilled I tried again with such great success and they popped easily out of my silicone molds after freezing which I was worried about! Can these be made without the honey? Sugar issues. They could, but I don’t think they would taste very good. I supposed whole ground stevia could be used instead, but I’ve never tried it. Thanks so much for publishing this. Regrettably my husband and I had never been very health conscious … enter a baby boy … and 3 years later I’m looking for snacks with low sugar content! 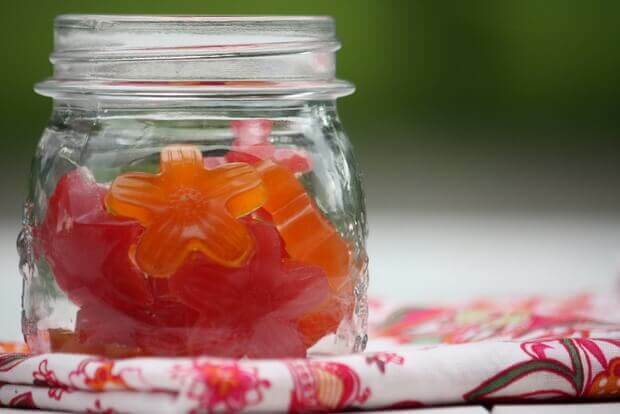 Your gummies are so easy and quick, and I’ve even made them using fruit juice. Great! I just made these again last night using fresh lime juice and 100% red cherry juice from Trader Joes! I used about half of each to equal the amount listed in your recipe. I also added the suggested drop of citrus essential oil! Man! Sooooo good! Cherry lime gummies! And they are all gone! I have to make more today! Thanks so much again Heather!! I made these tonight and they were not quite the gummy taste. They were close but I would still call them a firmer jello taste/texture. Could you explain a little more to me what cooking until they are melty would be like? What am I looking for? I do not want to cook them too long. But maybe I cooked them too short. The kids loved them!! The flavor was great. Can not wait to perfect these. Thanks for your help!! I made these today with just local fresh apple cider and gelatin and they were DELICIOUS! I doubled your recipe and it perfectly filled four silicone molds – thanks for the tip on those, it makes the gummies so much more fun for my kids. Now they can have “fruit snacks” like all their friends! I’ve been looking for ways to make safer treats for my kiddos. I’ll be making these as soon as I sign off. I am looking forward to trying these for the first time. After that, I’ll play around with making my own vegetable colorants to make life more interesting. Thanks!! these turned out really good i really liked the texture and fimness. Just one problem they still had a gelatin smell which i didnt like. anyone else have that issue? is there a way to kill that smell? my 3 yr old didnt mind it though she gobbled them up fast! how much gelatin can a kid eat anyway in a day? Where I live they do not sell powdered gelatin so I used Dr Oetker Gelatin sheets, after some experimentation i succeeded by using 11 sheets of gelatin with 1/3 cup fresh lemon juice, a few drops of lemon essential oil and 5 of the tiny Canderel sweetener pills, they turned out really good, nice and firm and I dont smell any gelatin odour at all. I thought it would be useful information for those who are not able to find powdered gelatin. I just made these with kombucha I had second fermented with berries. Used my last 2 Tbs honey and 1 of water; whisked until smooth before and during heating, and did not over heat. They are perfect! Can’t wait to see if the kiddo will eat them! Hmm, at what point in the process would you add the kombucha to not kill off all the good probiotics? Not sure what I did wrong, but I couldn’t get the mixture out of the pan, it just stuck – any hints/troubleshooting? What is the shelf life of the gummys? I was thinking how effective do you think a body butter made with this collagen would be to keep from having stretch marks while pregnant? Collagen proteins are too large to be directly absorbed through skin, unfortunately. I followed this recipe exactly as posted and the gummies did not set up. They never froze… and are pure liquid. What could have gone wrong? Please help. I purchased the vital Proteins from this site! Hi Susie, is it possible you used collagen peptides (the blue can) instead of collagen protein (green can)? The green can is the one that gels. SO sorry that happened! YES! I bought the blue can of peptides! DOH! I bought it solely to make the gummies. I didn’t realize there was a difference between the two products. I didn’t read the fine print, I suppose. Could you please post suggestions on how I can use up the peptides? They weren’t cheap… so I don’t want them to go to waste. Thanks! I was just wondering how long these are good for at room temperature. I see in the post that they will last 2 weeks I. The refrigerator. Can they be kept at room temp for any amount of time (say I want to pack it in a lunch without a cooler?) I made them today and my 2 year old loves them! Can’t wait until my 11 month old can eat honey! Thanks! Hi all! SO, I used my raspberry Emergen-C vitamin packets w/ some cherry juice, instead of the citrus juice, and no sweetener (besides the juice), and they are AWESOME. Kids and husband both love. I can’t believe they are so fast to make, too!! Thank you! Did you really use the food coloring you recommended for the photos because I used the same and the colors were gross. Yes, I used red and orange from India Tree. Sorry to hear they didn’t turn out the same for you! It really depends on whether your stovetop runs hot or not. You’ll notice that it blends together well when heated. Before heat, it can be mixed but the gelatin has a bit of a grainy texture until dissolved. After it becomes “melty” the grainy texture disappears. I keep hearing about the “awful” taste/smell of the gelatin. Does the citrus in the recipe get rid of that? The first batch I tried wasn’t flavored deeply enough to get rid of that smell which translates to taste. The citrus recipe here I tried (I added a touch more- maybe 1/2 cup instead of 1/3 and a little vanilla-also made sure to add zest) were delicious. Not a hint of that small/taste. i’d like to make these and ship them to my kids in college. how well do you think they’ll travel? if it takes a week unrefrigerated, will they mold? i see you recommend storing them in the fridge for up to 2 weeks. when you store them do they need to be airtight? Or freeze some water and nestle them all together in a small cooler. Then they’ll have cool water AND gummies!! My gummies are tasty, but they didn’t come out all pretty and translucent! Instead they are cloudy like a marshmallow. Did i cook too long (or not enough), whisk too much, or ??? That’s a great question. I’ve found that one side is usually cloudy and the other is translucent because of the way that the gelatin settles. If you pour the mixture into a pan and cut into squares you’ll need to flip them over to see the translucent side. When you’re using a mold you flip naturally to display the design – make sense? Oh, I forgot to ask! Should the gummies be kept in an airtight container in the fridge? I’ve made them before and they had a tendency to emit condensation, which the airtight container kept inside, and then the gummies melted and got moldy! What’s the best way to keep them? I use an airtight container and have not had this problem, but based on what you’re describing I would use something that is semi-airtight. Any thoughts on making these with pectin or another vegetarian alternative to gelatin? Would it work? I just made these and they are amazing! I juiced fresh lemons and one lime and added lemon extract as directed. Very good recipe! My freezer is rammed (our butcher just had a holiday sale) and have no room in the freezer. Will these set in the fridge or on the counter or will they be too loose? I used the gelatin you put the link to in the recipe ( Vital Proteins, Green lid) and the gummies smelled very undesirable, and tasted like they smelled… Is there any way to avoid this? I tried this recipe with the Vital Protein gelatin, they didn’t taste bad at all! Thank you sooo much for the recipe! About how much gelatin a week would you recommend for health? I added a little vanilla to mostly lemon juice with 1/2 a lime and honey. Yum!! They worked great. Thanks so much. Hi Heather! Do you know, can you freeze these and then let them come to room temp again? I want to have them on hand when I go into labor to take to the hospital, but obviously, that’s pretty unpredictable! Was thinking of making a batch ahead of time and freezing, but wasn’t sure how’d they do after being taken out of the freezer. Do you think I could put a bit of spirulina in them to make them greener (plus awesome benefits of spirulina)? Heather, I bought the molds you linked to, and just tried making homemade gummy snacks today for the first time. But once they were firm, I had a hard time getting them out of the molds, and a lot of them did not come out all the way (which was kind of a pain and not much fun for my 3 year old 🙂 ) Is there a trick to getting them out easily so they keep their shape? Hey Tessa, I’m so sorry I can’t be more helpful but I’ve never had trouble removing them. Maybe it would be helpful to pop them in the fridge and let them firm up a bit more next time? 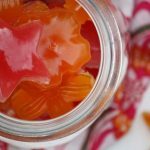 I love your blog post, Homemade Sour Gummy Snacks Recipe, and we would love to feature it on our website, GreenThickies.com. Would it be OK for me to use one of your photos within my post? I will of course link back to your post. Hey there! I am having trouble getting the gelatin to set. When I try the fridge or freezer, they just stay liquid. I have tried it a couple of times with no luck. I am using Vital Proteins Collagen Peptides. Does anyone have any suggestions? Thanks so much! Collagen peptides stay liquid at room temperature. You’ll need to use their collagen protein. Heather, are these safe to eat throughout pregnancy? Especially Early? Thanks so much! Hey, just wanted to say thank you for all of these amazing recipes. They turn out great and they are really helping me healthwise. I can’t thank you enough. Oh wow, these were the best gummies! I had tried another one but was left with a lot of gelatin chunks, even stirring consistently. These didn’t clump and I was able to triple the batch without compromise. The first single batch I made adding 5 drops of food grade orange oil-my 6 year old went crazy for them. This batch, I just left it w/out adding any other flavors. I love lemon! I was able to get, from tripling the batch: 28 one tablespoon gummies, and 7 two tablespoon gummies with a little left over. My husband eats one a day, our son eats two a day and I may or may not eat 3 a day. These will last about a week– Thank you! Wow this is just amazing, I will try to make it very soon, and I think the kids will love it! Mommypotamus you’re awesome! Fancy having three little ones and having time to do this. So many things for me to try. You’ve made playing with my new all in one cooker so much less hazardous! Next Post Want To Reverse Your Eczema? Read This!